There are a three kinds of Perfectionist Patterns. You always believe that you must do more on projects because they are not good enough yet. You work far too long on tasks because you are never satisfied. You often work right up until deadlines or turn your work in late. Your Perfectionist Part is afraid to finish projects because it believes this will expose your shortcomings and lead to your being judged, and—even worse—ridiculed. You can’t produce anything because it has to be perfect the first time. Your ideas are blocked because they aren’t good enough to put out. Your Perfectionist Inner Critic doesn’t allow you to be a learner or to experiment because both of those situations involve putting out work that is far from perfect at first. This frightens your Perfectionist Part because it is afraid of your being judged, shamed, or rejected if your work isn’t always perfect. Your world must be perfectly in control and in order. You must get everything right. You must always do the right thing and make the right choice. Your home and family must look perfect. You must be perfectly groomed and behave impeccably. You exert rigid control over your behavior, which takes away your vitality and spontaneity. Your life must be perfectly in control and predictable in order for you to feel safe. And of course, this is impossible. If you have the Passive-Aggressive Pattern, you may act in a way that looks on the surface as though you are agreeable and pleasing, but in the end your behavior hurts or frustrates people. You may only be aware of your surface desire to please people and your fear of not pleasing them. When you are acting out the Passive-Aggressive Pattern, there is an unconscious part of you that is resentful or defiant. This part is irritated at how much you give in to what someone wants. Or the part may feel resentment toward that person. However, that part doesn’t believe that it has the right to be angry or defiant, so those feelings go underground. You act in seemingly agreeable ways, but you add a mean little twist to your behavior that frustrates the other person. For example, your partner asks you to do something for her that needs to happen by a certain date. You agree to do it, but then you forget about it until after the date has passed, and she has to suffer the consequences. Consciously, you just forgot, but your Passive-Aggressive Part did this on purpose to punish her. There is a woman at work that you are attracted to. You have no intention of acting on this because you are married. Your wife has met her and is jealous of her beauty, so she has made it clear that she doesn’t want you to even have a friendship with her. Part of you resents this restriction, but you push this into your unconscious and agree with your wife’s demand. However, you agree to have lunch with the woman without telling your wife, rationalizing, “I know I’m not going to have an affair, so what’s wrong with just having lunch?” However, you “accidentally” leave a clue that alerts your wife to the lunch. She is very upset. Your Passive-Aggressive Part has “gotten” your wife, in retaliation for her trying to restrict your contact with this woman. It isn’t easy to know how much you have this pattern because it is often unconscious. In addition, most of us don’t want to admit to having this pattern because we see it bad thing. However, it is fundamentally no different from any other protective strategy. Passive-Aggression is one of the many topics that we cover in the Advanced IFS Classes. What are Patterns of Conflicts in Relationships? When a couple gets into a repeated intractable conflict, it is usually because they are triggering each other’s patterns (IFS protectors) and wounds (IFS exiles) rather than interacting from healthy capacities. In fact, for each couple there is usually a repetitive sequence of transactions that can be mapped out, or perhaps a few such sequences. Richard Schwartz, the creator of IFS, has explained how these sequences happen in his book You Are the One You’ve Been Waiting For. The Pattern System adds the ability to see exactly which patterns and wounds are involved. Let’s look at an example. Jean becomes upset at her husband, Todd, because she feels that he hasn’t been sensitive to her. She has been feeling despondent over her struggles at work, and Todd hasn’t been very supportive or attentive to her feelings. As a result, her Not Seen Wound has been triggered. However, it is rare that people interact directly from their wounds. Often they aren’t even aware of the wound that has been triggered. Instead, they usually react with a pattern that protects against the pain of the wound. So Jean says to Todd, “You are so cold! You never care about my feelings.” Jean has led with her Judgmental Pattern. This serves two functions. It tries to protect her from feeling her wound, and it is a misguided attempt to get what she wants from Todd. Communicating from a pattern usually backfires. Jean’s blaming makes Todd feel bad about himself by triggering his Judgment Wound. However, Todd isn’t aware of this wound and doesn’t show it. Instead, he withdraws from Jean to close down his heart, keep himself from feeling the pain of this wound, and stay away from Jean so he won’t get hurt further. This is his Distancing Pattern. Todd’s withdrawal triggers a second wound in Jean; she feels abandoned by him (Abandonment Wound). She defends against this wound by criticizing him for withdrawing (Judgmental Pattern), which activates his Judgment Wound again. He reacts to this with more Distancing, so the cycle repeats itself. They often go around this cycle multiple times, escalating their level of anger and hurt in the process. This is an example of such a common process that almost everyone has experienced it. I certainly have in my relationships. And it is very painful for both people. Each person feels that their partner is being unreasonable and hurtful, and trying to talk about it often just produces more pain because each person is likely to judge the other. Furthermore, each person feels cut off from their partner’s love, so there is a tendency for both of them to feel alone and abandoned. The best way to start changing these sequences is to understand what is going on, and the Pattern System can help with that. 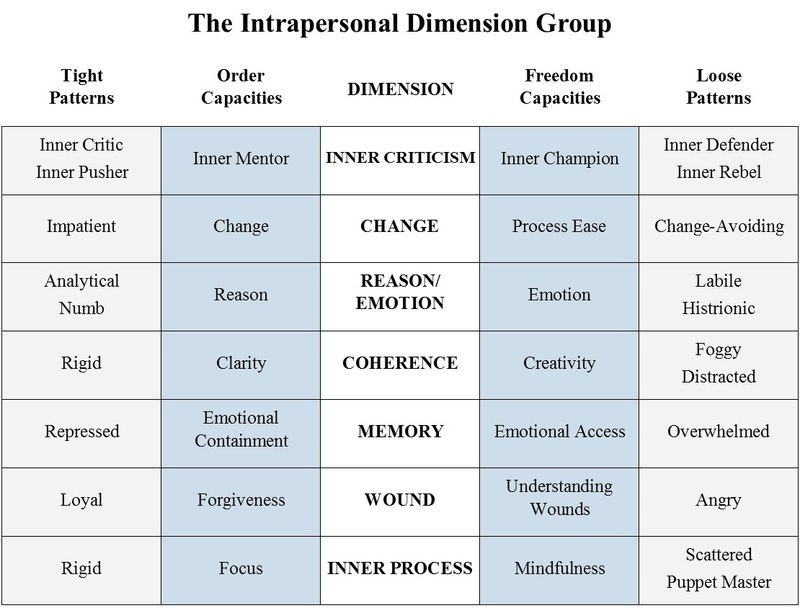 In this article, I will focus on the Wound Dimension, which you can see on the next to bottom row of the chart below. 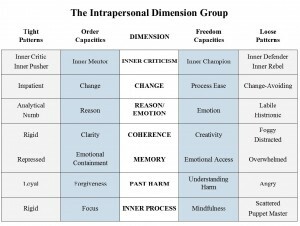 In a previous blog, I discussed the Inner Process Dimension. 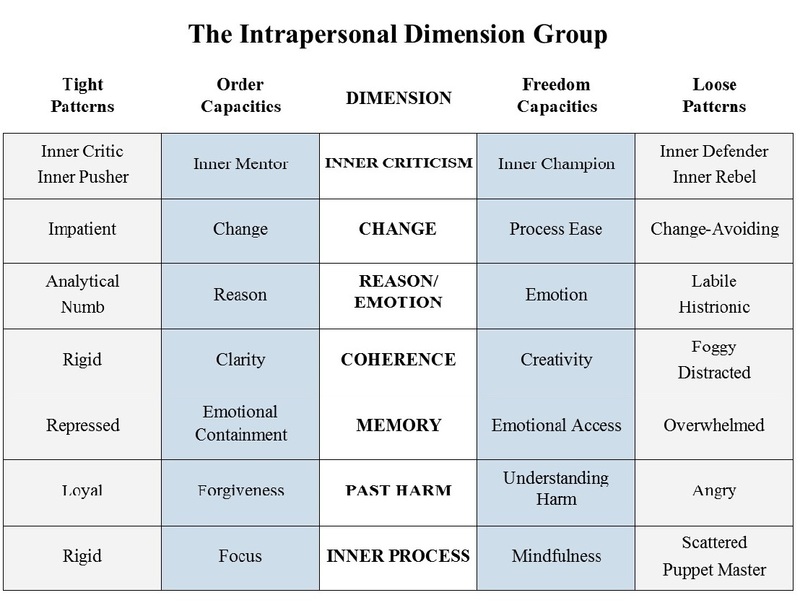 This dimension is about your attitude toward the way you were wounded in the past, usually in childhood. This is important because it is a central aspect of IFS work and of most forms of psychotherapy. The two healthy capacities in this dimension are Understanding Wounds and Forgiveness. With the Understanding Wounds Capacity, you are interested in discovering how you were wounded in childhood so you can heal these wounds. With the Forgiveness Capacity, you are able to forgive the people who wounded you. Forgiveness doesn’t mean condoning the way you were treated. It means letting go of your resentment. Forgiveness is primarily for your well-being, though it may also enhance your current relationship with your parents (or whoever wounded you). Even though Forgiveness is an important part of healing, be careful not to push yourself to forgive before you are ready. Many people need to first feel their wounds and their anger about the way they were treated and heal their wounds. Then they are ready to forgive. This is fine. The two problematic patterns in this dimension are the Angry Pattern and the Loyal Pattern. With the Angry Pattern, you not only feel and express your anger about how you were harmed or deprived as a child, but you can’t let go of the anger even after it has been fully expressed. This will ultimately get in the way of your healing because this defensive kind of anger often blocks your access to the pain of your wounds, which is necessary to feel into order to heal them. And it also blocks Forgiveness, which is important to healing. If you have the Loyal Pattern, it means that you feel such loyalty to your family or to one of your parents that you are unwilling to realize how they wounded you. You may be afraid of hurting the parent or making them feel bad. You may be afraid of losing your connection to your family if you let yourself realize how they hurt you. You may be afraid of not pleasing them and losing their approval. It is important to realize that understanding your wounds is not about blaming your parents. It is about seeing and feeling how you were wounded so you can heal your wounds. Your parents may have given you many positive things in addition to how they wounded you. Recognizing the wounds doesn’t negate the positive. And it doesn’t need to undermine your current relationship with your parents, if that is now good. If you refuse to see what happened to you out of loyalty, it makes it hard to heal. If you have the Victim Pattern, you believe that your life situation is impossible or that someone has wronged you. In other words, you believe that your problems exist because bad things were done to you. Granted, difficult things may have happened in your life, as they do in all our lives. The difference is that you feel like the victim of these circumstances, and you believe that there is nothing you can do about it. This webinar will help you to determine if you have a Victim Pattern–or if your partner (or someone else close to you) does. You will learn how the pattern operates, what its underlying dynamics are, and how to change it, using IFS and Self-Therapy Journey. You will also learn how to relate to someone with the Victim Pattern and how to encourage them to change their pattern. You will learn how to develop the Responsibility Capacity instead of the Victim Pattern. Responsibility involves recognizing that you have choices available to you at all times and that the direction of your life is up to you. The Responsibility Capacity helps you to see that there are many small and large things you can do every day that influence the flow of your life. You can see that it’s ultimately your job to figure out your life and to do your best to identify and attain your goals. This leads you to a sense of personal power and the ability to make your life work. Do You Have A Self-Effacing Pattern? The Self-Effacing Pattern is one of the patterns in the Social Dimension of the Pattern System. It is often referred to as “shyness.” It has been one of the major patterns that I have worked on over the years. 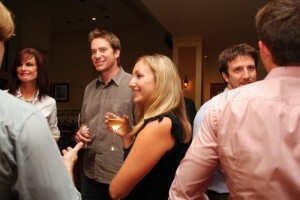 If you have the Self-Effacing Pattern, you may feel shy and awkward in social situations and not speak very much. You may withdraw from people and have a hard time reaching out for connection. You may actually avoid social situations. You may have a hard time speaking up about your own ideas, stories, or achievements, especially in group settings. You may feel that you don’t deserve to be heard or appreciated. At times, you may feel incompetent or inadequate. Because of your quietness, you may be seen by others as aloof. Some people are quiet and solitary by nature, and happy to be so. The Self-Effacing Pattern applies to you if you are quiet, but unhappily so. You wish you could speak up and be recognized. You would like more connections with people and people to know and like the “real you.” You want to be able to reach out to others with self-confidence. While you can’t always be sure of how others will receive you, you CAN change your underlying belief that you are “less than” others and unworthy of attention. You can work through the fears behind your Self-Effacing Pattern—the fear of rejection or ridicule. You can learn to develop the Social Confidence Capacity, where you feel free to be yourself in social situations. You can work on and transform the Self-Effacing Pattern using Self-Therapy Journey, my online tool for personal growth and healing. Click here to learn more.